Handcrafted in small batches, these crackers really are something special. They are wonderfully crispy and delicate, and full of wholesome natural flavours. The delicious combination of olive oil and rosemary – which is picked from our own garden - create the beautiful aromas of a Mediterranean diet. The olive oil adds moisture as well as a whole host of health benefits. 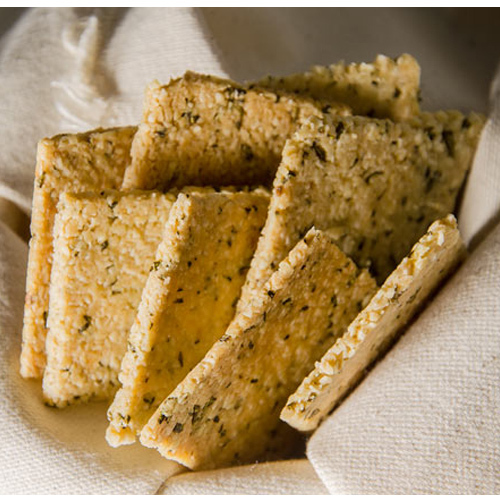 Just like the Chia Crackers, they can be eaten on their own or enjoyed with something savoury. They are also made in small, irregular square shapes, and make the perfect substitute for a bag of crisps. There’s nothing nasty or unhealthy in them - have a look at the list of ingredients!